How many customers does Facebook have? That appears to be the question taxing analysts at the moment. The reason is that they want to work out if Facebook is worth $100 billion or not. For this, they guess that Facebook needs to make $5 billion a year in profit. Why? Well, if we go to its nearest neighbour, Google, it is valued at twice as much and earns about $10-$11 billion in profit a year. The best way to apparently make these numbers ‘real’ is to consider them at a user-level. That means working out how many users Facebook has. For example, each month, Google’s sites receive around 1 billion global visitors. So that translates into a profit of $1 per user per month. So for Facebook to earn its valuation it would need to have the same volume of users as Google and earn $0.50 from each per month or some other variant of per user profits times the number of users. We define a daily active user as a registered Facebook user who logged in and visited Facebook through our website or a mobile device, or took an action to share content or activity with his or her Facebook friends or connections via a third-party website that is integrated with Facebook, on a given day. We view DAUs, and DAUs as a percentage of MAUs, as measures of user engagement. There are 483 million of these. 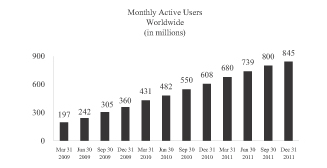 And what is more, the number of daily active users is growing faster than the number of monthly active users. Finally, there are about 425 million monthly active users from mobile products. On page 74, there is an even juicier titbit of data stating how many users visited were active on 6 out of the last 7 days: 360 million. The problem analysts face is trying to work out what to make of this. For starters, a user of Facebook is not like a user of Coca Cola. In the US, each person consumes, on average, 34 drinks of Coke per month. And each one of them is paying for it. I’m sure the ‘active user’ number is considerably higher but who cares? All that matters is the total amount of Coke consumed. Now we could play the same game with regard to Facebook’s ‘real’ product: advertising. Now it is a little hard to work this one out but it seems that from Comscore, conservatively, there are about 5 trillion ad impressions displayed in the US each year. Facebook have about 28% of those which translates into 116 billion impressions per month in the US. Now its quarterly total display revenue is $943 million but this is world wide. If ad revenue tracked user shares then 21% of users are in the US and so one could guess that at least $800 million in annual ad revenue is coming from that. That would mean Facebook are earning around 57.2 cents per thousand impressions. That seems to be a low number. Quite low, maybe 25 times too low, according to this. (So they haven’t worked out how to translate all that private information and ‘likes’ into targeted ads yet.) But I could certainly be missing something; I don’t have a good sense about what market rates should be. And what I have seen are for big banner ads and that is not what Facebook are doing. My point is that this is a number to watch and depending on how you look at it, it is worrying or it represents untapped opportunity. After all, there is nothing about Facebook that suggests it can’t earn impression prices similar to other media sites. Here is the thing, analysts are trying to extract revenue per user and to benchmark it. But in a network industry the user who posts one significant update each week can be as valuable to their friends as one who shares daily. People are using Facebook for both of these types of users and there is currently no metric that can make a weekly visitor worth one seventh of a daily one. Both are producing the product that is Facebook and neither of them can be chopped up or scaled to tell us what their contribution to that product is. There will always be a size distribution of usage of services like Facebook and what is more Facebook is set up precisely so the less intense users are as valuable to the ecosystem as the more intense ones. The fact that it is the more intense ones whose eyeballs advertisers are capturing is beside the point. Taken together the set of users determine the aggregate of advertising revenues. On that basis, Facebook’s valuation will be justified if it can work out who to increase its current revenues five-fold. The only interesting fact we know is that Facebook decided to go to IPO before working out how to do that. That said, the founder hasn’t exactly divested himself of a big equity stake and so it is clear he’s not willing to cash out on the current valuation just yet. Google earns $10-11 billion per year, has 1 billion users per month. Okay, I can accept those figures, but that doesn’t mean it makes $10 per user per month. More like 75 to 80 cents. @conor. Good point. Some incorrect division. I’ll adjust it. I don’t see what’s the problem to calculate? or maybe to rephrase it as say a potential investor, at what point do I give a sh*t about “potential customers”, as in the right circumstances you could say there are 7 billion on the planet… but realistically its less than 1% of it… all you really can go on is what they actually earn NOW… what the annual tax-return form says its earning as out and out profit… anything else is merely upping the ante and begging for another enron! Previous PostPrevious Does Zuckerberg need to fail?